I’m a huge wimp when it comes to temperatures that rise above 80 degrees. Makes me tired and cranky. Therefore, I love to have delicious summer salads in the fridge when it’s hot outside. The last thing I want to do is cook anything in the heat of the day – even grilling sometimes requires more energy than I’m willing to expend. This quinoa salad is perfect because it’s a meal in itself. Sure, you could serve it alongside grilled fish or chicken and a slice of crusty bread would be lovely with it. But, if you want a meat-free, gluten-free, veggie rich meal with plenty of protein and fiber, this salad satisfies on its own. 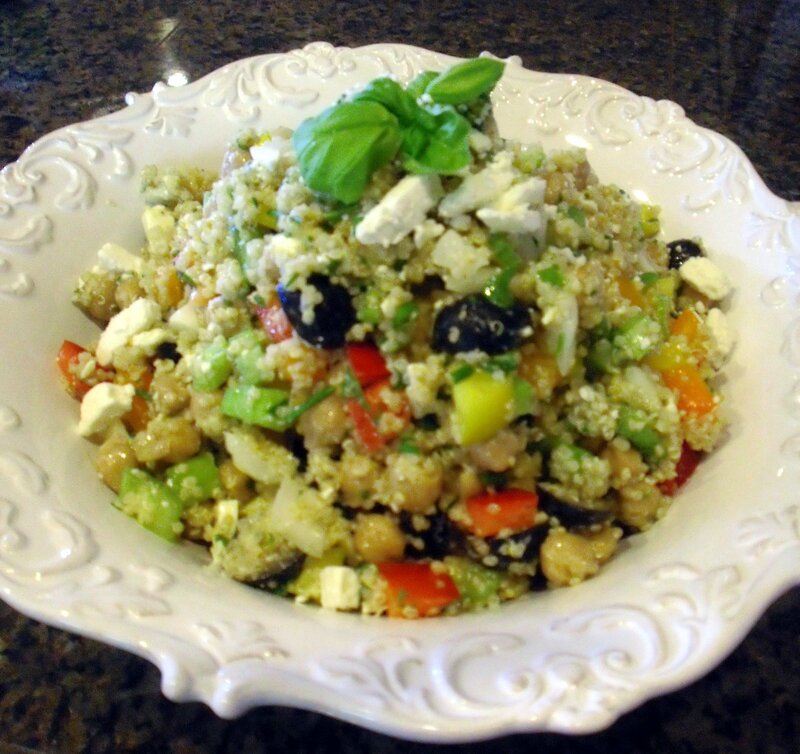 Let’s talk a bit about quinoa (pronounced keen-wah). I know many of you are already quite familiar with it so you can ignore this part if you wish to. 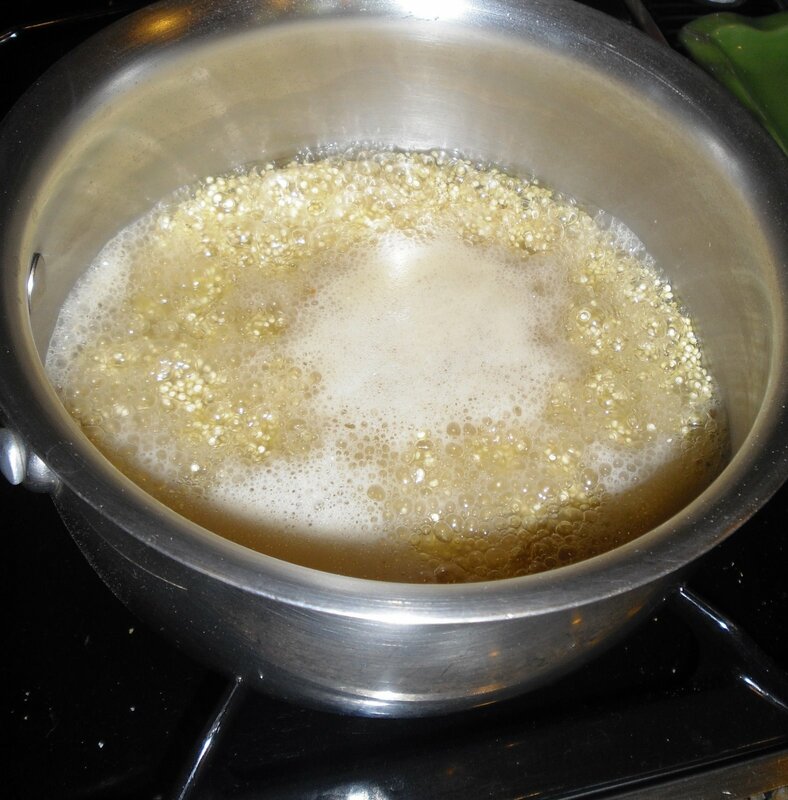 Quinoa is used like a grain but is actually a seed. It is cooked similar to rice and has a soft/crunchy texture with a bit of a nutty flavor. I will admit, I was not a huge fan when I first tried it. It was kind of bitter and I just didn’t enjoy it that much. Once I played around with it, though, I found I really liked it as long as I added big flavor. The health benefits are amazing. One cup, cooked, has 8 grams of protein and 5 grams of fiber as well as many other important vitamins and minerals. It is actually considered a complete protein because it has all 9 essential amino acids required as building blocks for muscles. That said, you’ll find it’s also more expensive than most rice or pasta, on average just under $1 per serving. I think it’s worth it, though, when you consider that it can be a complete meal. 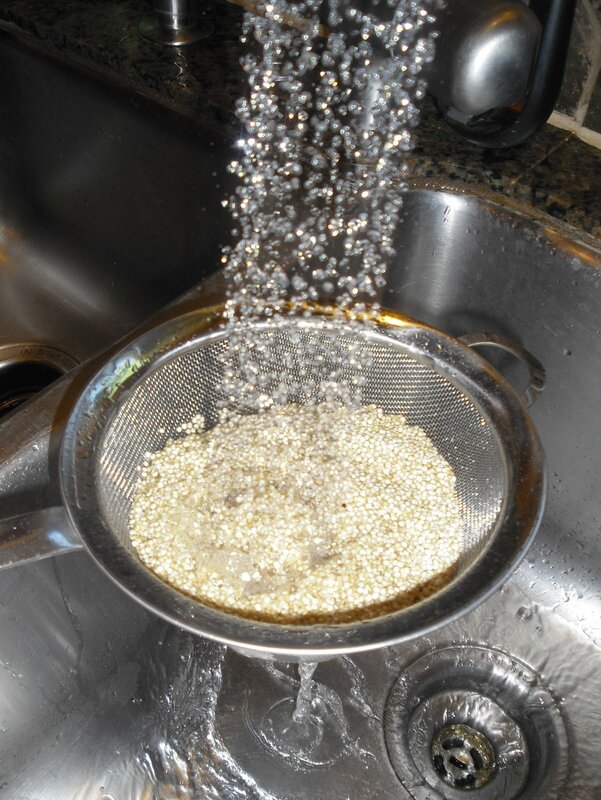 Always rinse quinoa thoroughly (even it says it’s pre-rinsed) to remove any bitter flavor. For this salad, I’ve used 1 cup uncooked quinoa. 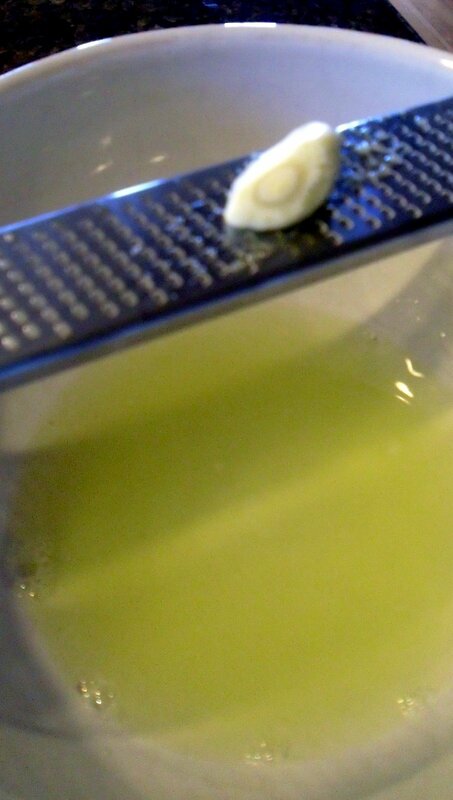 Once rinsed, place in a saucepan with 1 1/2 cups liquid (water, chicken stock, vegetable stock). Bring to a boil over med-high heat. Boil 15 minutes or until all the liquid has been absorbed. Cover for 5 minutes, then fluff with a fork and set aside to cool. 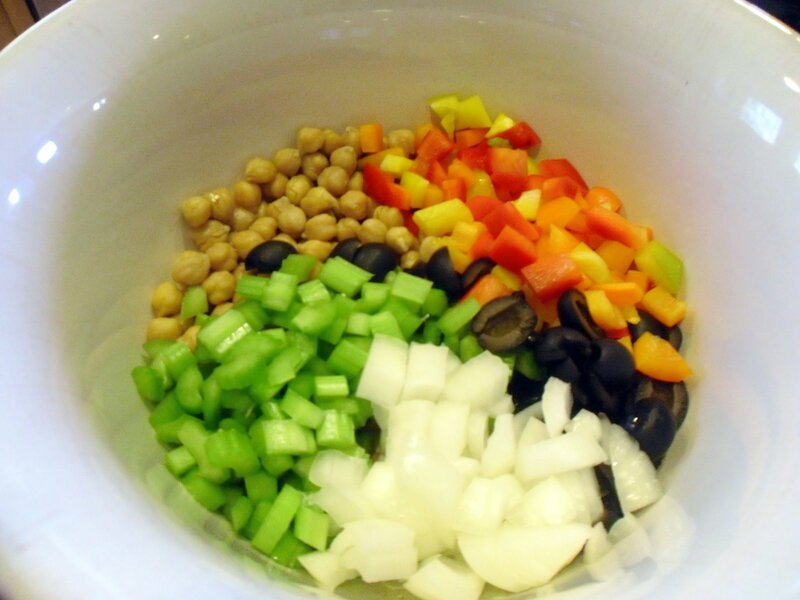 Meanwhile, prepare veggies and place in a large bowl. 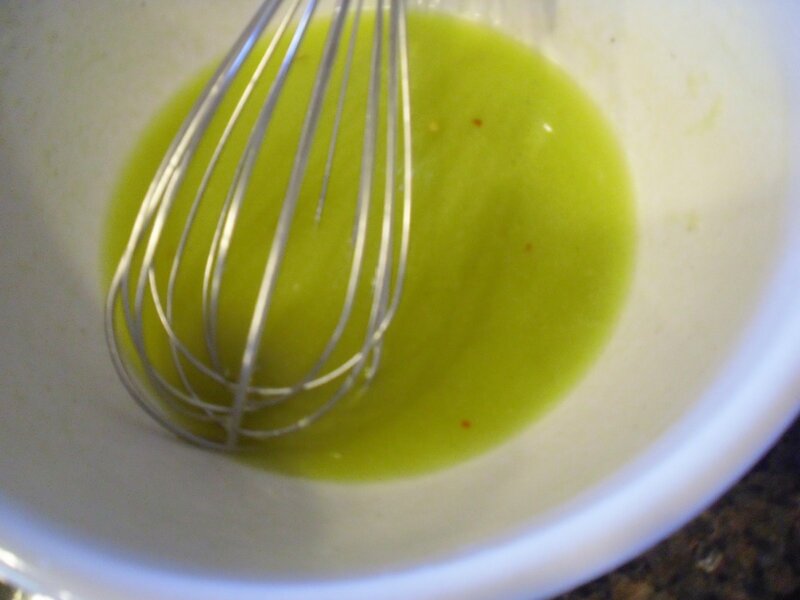 In a smaller bowl, prepare the dressing. Finally, place cooked quinoa, dressing, 3/4 cup feta cheese and 1/3 cup (packed) chopped fresh herbs (I used basil, arugula, and chives. Rosemary, thyme or oregano would work as well.) in the bowl with the veggies. Chill and serve whenever you want to. Makes 8 – 10 servings so you can serve it to a crowd or eat it all week as I intend to do. Bob had this salad for lunch today and really liked it. Good thing since he’s having it for dinner as well. 87 freaking degrees out there today! I know that’s just perfect for some of you but not this girl. 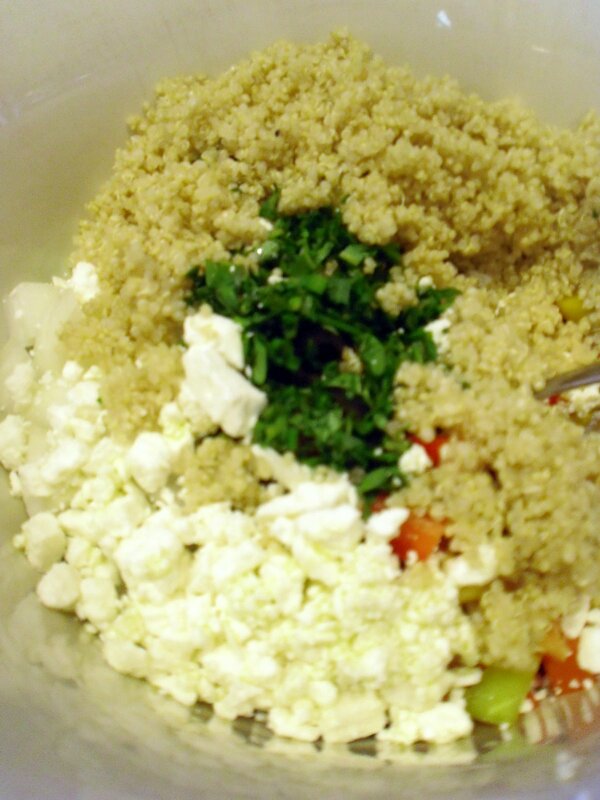 I hope you will play with your quinoa and add your favorite veggie/cheese/herb/dressing combinations. It is also good with sweet ingredients, dried fruit, etc. but we’ll talk about that another time. Stay cool… unlike me.